Simple Exfoliating Cleansing Facial Wipes gently lift dead skin cells to leave your skin revived and revitalized, plus they contain a perfect blend of our purest possible skin loving ingredients with added vitamins. The wipes both exfoliate and cleanse, all in one wipe. These wipes leave no residue behind, just clean and refreshed skin, there is no need to wash your face after use. They also help maintain skin's natural barrier, leaving skin feeling soft, instantly hydrated and refreshed. 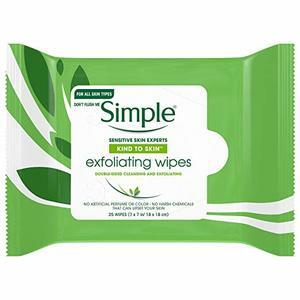 Simple Exfoliating Facial Wipes effectively remove dirt and makeup from your face while also clearing dead skin cells that can lead to breakouts. This makes room for the new cells your body produces, leaving your skin revived and revitalized. Simple Exfoliating Facial Wipes puts all your exfoliation needs into a convenient wipe that leaves even sensitive skin feeling smooth and refreshed. Simple's skin-loving ingredients clean without drying or leaving unwanted residue, so even sensitive skin is safe. Convenient for on-the-go use, these wipes can clean, invigorate, and refresh your skin no matter where you are. Simple is a complete range of facial skincare products perfect even for sensitive skin. The Simple brand knows that what is left out is as important as what is put in when it comes to gentle, yet effective skincare. The complete Simple range has 18 products, including cleansers, moisturizers, eye care, and wipes. All Simple products have no dyes, artificial perfumes or harsh irritants that can upset skin and contain skin-loving ingredients and added vitamins for natural, healthy-looking skin. Simple products are hypoallergenic, non-comedogenic and pH balanced. Exfoliating Wipes have 2 added Vitamins: Pro-Vitamin B5 which is known to help restore, soften and smooth skin, and Vitamin E which is known to moisturize, nourish and protect your skin. These wipes feature two sides: one for exfoliating to remove dirt, oil and dead skin cells and one for cleansing which helps leave your skin feeling smooth, refreshed and soft. Simple Kind to Skin Kind to Skin Exfoliating Facial Wipes, 25 ct Water (Aqua, Eau), Cetearyl Isononanoate, Panthenol, Tocopheryl Acetate, Aloe Barbadensis Leaf Juice, Glycerin, Cetearyl Alcohol, Ceteareth-20, Glyceryl Stearate, Ceteareth-12, Sodium Citrate, 2-Bromo-2-Nitropropane-1,3-Diol, Disodium Edta, Phenoxyethanol, Methylparaben, Propylparaben. Lift seal and remove wipe. Gently wipe over face and neck to cleanse the skin. After use, dispose of wipe in trash (do not flush). Reseal pack to keep wipes moist. Avoid direct contact with eyes.